For Example: Suppose another driver runs a red light and your car is totaled. You have insurance on your car, so you call your insurance carrier and they pay you for all of your expenses related to the accident. Your insurance company, realizing that the other driver had an insurance policy, then seeks reimbursement from the at-fault party’s insurance carrier. Your insurer is “subrogated” to the rights of your policy and can “step in your shoes” to recover any amount paid out on your behalf. This is the definition of subrogation. Subrogation can apply to all different types of policies, personal and business related. Example:Suppose your child starts a fire at their school causing $6,000.00 in damages. The juvenile court orders you to pay for the damages to the school. 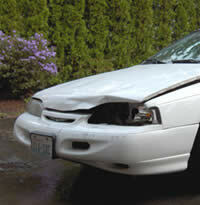 You might have coverage for this incident under the negligent supervision clause of your homeowner’s insurance policy. You should contact them immediately to find out if coverage applies. What if you arrive at your business and discover it is destroyed by fire caused by a defective copier that you purchased. Your insurance company would pay the claim and then subrogate against the manufacturer of the copier to recover the expenses paid out. Most insurance companies would attempt to recover any out-of- pocket expense you might incur as well. Why is subrogation becoming so important in the insurance industry and how can it benefit you, the policyholder? Subrogation is important because any monies recovered through the subrogation process go directly to the insurance company’s bottom line. The benefits of subrogation have been demonstrated in company performance. This is according to the Ward Financial Group, a firm that researches property/casualty operations and identifies operational benchmarks that distinguish high performing companies. According to a study by Ward, companies that achieved superior operating results subrogated claims at about twice the rate of average companies and recovered substantially higher percentages of their loss payments through subrogation. A company with an effective subrogation department can offer lower premiums to their policyholders. AMIS Disclaimer: The information in this article may be legally privileged. It is intended solely for those visiting our website. Neither William R West nor AMIS is liable for any errors or omissions in this material or misuse of this information.